The aim of the first part of the project was to design and implement the functionality necessary to establish communication between the mobile of the user and the different environment control systems. 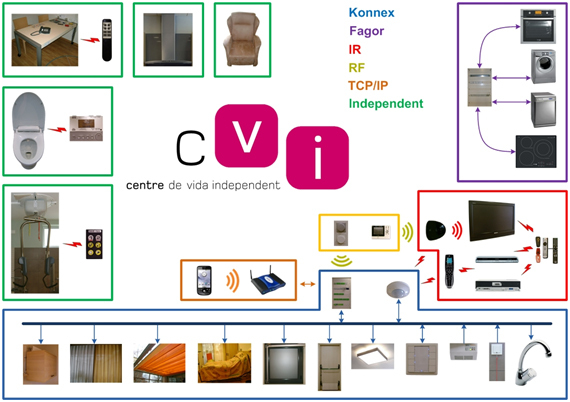 In the image below you can see the different scopes of control currently on the CVI and the interaction that exists between the different devices. – Implementation of an API to control the existing scopes of control: This API allows an easy use by other applications and has been used to create an interface of direct action by the user. At the moment this API controls any device that is connected to the KNX data-bus. – Implementation of a desktop application to show its usages using the API developed. – Implementation of an Android application as an example of home control using Wi-Fi. – In the picture above, the outcome of this work can be seen on a mobile phone (orange box) and a Wi-Fi router with which you can control the access to certain devices.